Starting with the Sojourner rover, launched in 1996, NASA has sent four robotic rovers to the Red Planet. On November 26, 2011, NASA launched Curiosity, its most technologically advanced rover ever. At a glance, it’s easy to see the size evolution between NASA’s youngest and oldest rover, but how else have they evolved? 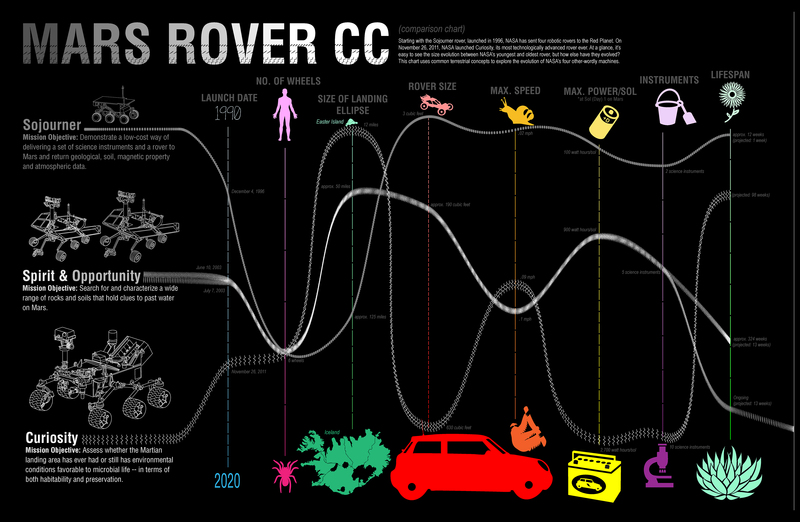 This chart uses common terrestrial concepts to explore the evolution of NASA’s four other-wordly machines. Infographic originally produced by Kim Orr and featured at JPL’s infographics website located at http://www.jpl.nasa.gov/infographics/index.php.